Steampunk bands turn holiday traditions on their head through their dark and clever songs. So, the holiday season's trampling over us all like a pack of rabid, horny reindeer on meth. With it starting earlier and earlier every year (next year it'll probably kick off just as the last 4th of July fireworks fizzle out) that means we're all getting an extended exposure to that delightful genre of auditorture labeled "Holiday Music". I don't know about you, but I'm sick of hearing the same three songs about these mythical characters named "Santa", "Frosty" and "Rudolph" every single time I step in a store. Sure, they're "timeless classics", which I think is code for safe and innocuous enough that repeated listenings won't make the listener want to gouge their ears with candy canes. However, having heard them thousands of times since my youth, they've gotten a bit old hat. I want something fresh. 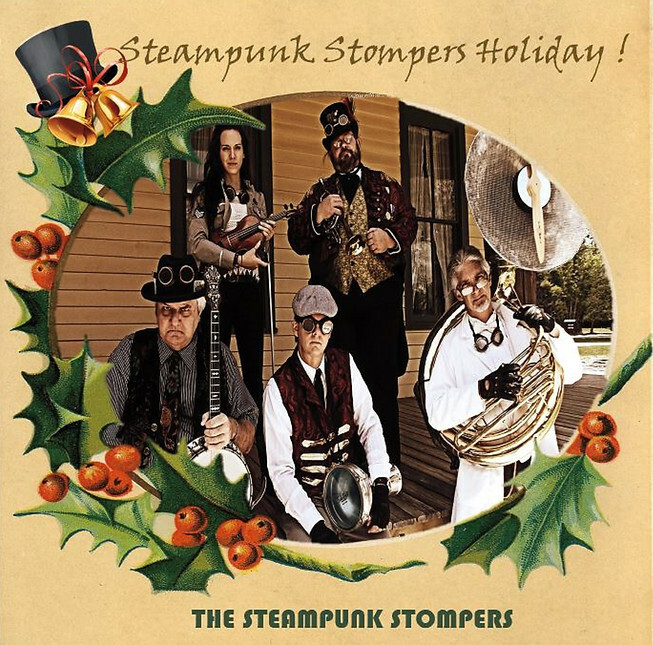 Thankfully, there are some steampunk bands out there grabbing the whole idea of holiday music by the throat and giving it a good, sound shake. New for 2015! New Orleans jazz, swing, and even trance collide on the Stompers' third release. Each of the seven tracks sounds unique from the others, leaving you wondering where Mark Pettey and the rest of the Naples, FL-based band will lead you next. Guest stars include Jig to a Millstone's Victoria Ann Van Arnam on hammered dulcimer, lending an eerie vibe to the band's rendition of "Shchedryk". New for 2015! Drawing inspiration from the 19th century tradition of families gathering to tell ghost stories on Christmas Eve. Using only Braxton's double bass, Sarah's voice, and a wash of reverb and delay effects, the album is supremely atmospheric, a beautiful counterpoint to typical upbeat Christmas music. Light the candles, dim the lights, and let their soundscapes consume your imagination. Valentine Wolfe's "Ring the Bells"
New for 2014! A haunting, chamber metal ode to winter's darkness. Victor Sierra's "Angels Roll Out the Night"
New for 2014! The French trio are back with an all-new single in their unique world-industrial style. Spiky's "Kidnap the Sandy Claws"
New for 2014! Nobody does dark, orchestral music quite like Spiky. Frenchy and the Punk's "Halloween for Christmas"
Steampunk tends to flip traditional ideas on their heads, and F&tP's Scott and Samantha do just that with a witty ode to their favorite holiday. Hint: it's not Christmas! Victor Sierra's "The Xmas Case"
This noirish, apocalyptic view of the increasingly commerical holiday rings far closer to reality than many people want to admit. Ever seen those videos of people trampling each other at Walmart on Black Friday? This visceral, visual song could be the soundtrack. 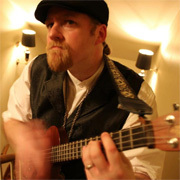 Valentine Wolfe's "A Victorian Villain's Christmas"
This delightful duo are an enjoyable dichotomy, with their ethereal, goth-influenced, keyboard and bass-driven music at odds with their fun-loving personalities. If you had any doubts these two have a grand ol' time making music together, just watch the video! Mr. B's The Gentleman Rhymer's "Oh, Santa!" The chap-hop maestro delivers a cautionary tale about leaving out too much booze for Santa. Irreverant. Cheeky. Ballsy. TMTWNBBFN's four track EP kicks Christmas in the head. How can one hate the catchy, crafty "Ebenezer's Carol" or the Rammstein-esque metal version of "Silent Night"? If you're on the hunt for steampunk renditions of the classic holiday standards, look no further than the following collections! This Seattle band has crafted lovely, atmospheric interpretations of classic standards. Danceable. Infectious. Good times ahead! Is Christmas not complete for you without Cthulhu? For the Lovecraft fans, the H.P. Lovecraft Historical Society has twisted the old Chrismas standards in all new, horrifyingly cheeky ways!